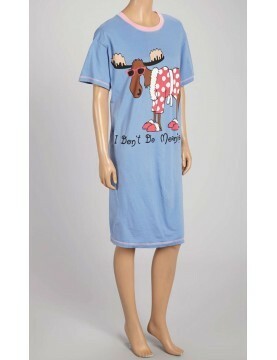 Ultra-cozy long-sleeve shirt and pants pajama set, designed in bright blue and white soft, jersey knit fabric. Details, details, like a sweet row of smocking, pretty pleating and lace accents define this delicately soft cotton nightgown. Women's all cotton pretty floral-print robe accented with lovely satin piping. Embroidered blooms cascade across the comfy all cotton of this women's nightgown that will leave you beautifully adrift in dreamland. Natori Long Nightgown in Katerina abstract print energizes this figure-skimming, ankle-length nightgown. Carole Hochman brand nightwear set offering a sleeveless chemise with a small satin bow at the V-neckline and a co-ordinating robe with long sleeves. This Night Shirts was created for the person that prefers to wear something different from the rest and thrives on being the center of attention. These night shirts are designed solely for those who appreciate art and enjoy wearing it at the same time. This Night Shirt was created for the person that prefers to wear something different from the rest and thrives on being the center of attention. These night shirts are designed solely for those who appreciate art and enjoy wearing it at the same time. 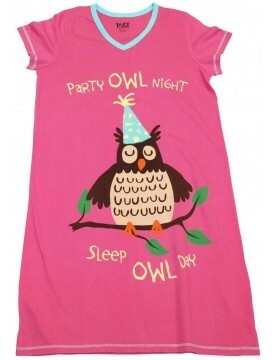 You'll absolutely love this Party Owl V-neck nightshirt.Whether you wear it to simply sleep in or to just lounge around, you can count on looking unique! 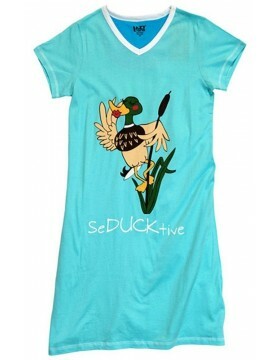 You'll absolutely love this LazyOne Seducktive V-neck nightshirt.Whether you wear it to simply sleep in or to just lounge around, you can count on looking unique!V-neck style, tapered cut a shorter sleeve and a splash of contrasting color inside the neck. 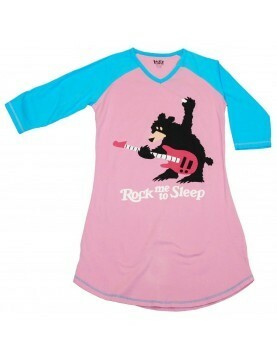 You'll absolutely love this Sheep Walker V-neck nightshirt.Whether you wear it to simply sleep in or to just lounge around, you can count on looking unique!